On March 16, 1968 U.S. Army forces invaded a village in South Vietnam, killing hundreds of unarmed civilians in an event known as the My Lai Massacre. Twenty-six soldiers were later charged with criminal offenses for their roles in the murders, but only Lt. William Calley was convicted and sentenced to life in prison forty years ago today - on March 29, 1971. Many Americans were outraged over the conviction, arguing that Calley was a scapegoat for the Army’s continued failures in Vietnam. Constituent letters flooded the offices of politicians and five state legislatures requested clemency for the soldier. Calley’s sentence was ultimately reduced to ten years. He served less than four years under house arrest in his quarters at Fort Benning before winning an appeal for his release in 1974. 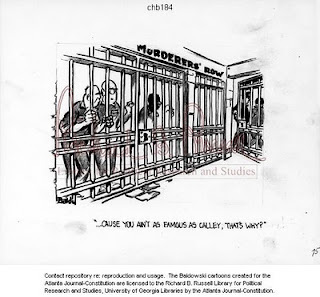 Right: This Clifford Baldowski cartoon depicts prisoners locked behind bars in "murderers' row" looking on as William L. Calley, Jr., is walking out of the prison doors. Selected from The Clifford Baldowski Editorial Cartoon Collection, Richard B. Russell Library for Political Research and Studies.